As you know, I have been looking for ways to class up my look for work. After spotting these red suckers on my blogger pal BSOUP's page, I felt like "you know what, I can pull these bad boys off." Off I went to Target.com and ordered them. 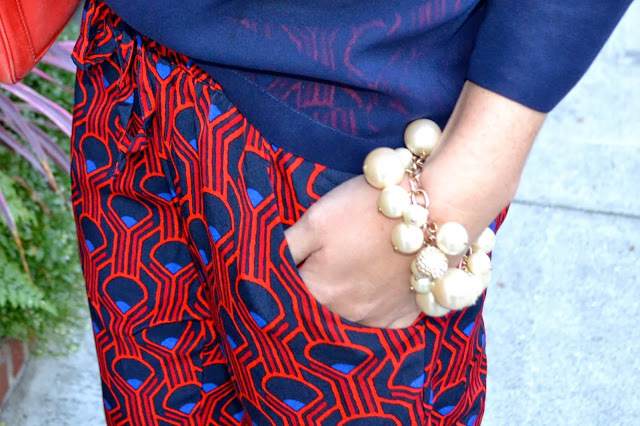 Much like with my other pair of slouchy pants, I paired these with a neutral blouse and heels. I added a red lip and bag, and a chunky pearl bracelet and called it a day. These are so fun! I can't believe they are Target! What a fab find! Great look. I'm in love with those pants.